Having had some experience with Israel Weapon Industries (IWI) Ltd. products, the recent announcement of the Tavor TS12, a bullpup semi-auto 12-gauge shotgun that looks like something out of the future, got my attention. This thing is no gimmick. It’s a serious piece of emergency survival equipment that packs a wallop. Chambered for the potent 3-inch 12-gauge magnum shell, it’s a compact package for what I have occasionally called “mean business” chores. That is, when you mean business, the Tavor TS12 is the kind of tool you reach for. At the recent Shooting, Hunting and Outdoor Trade (SHOT) Show, curious people got the lowdown. Weighing 8 pounds empty, the TS12 has 3 magazine tubes to give this smoothbore plenty of firepower—up to 15 +1 rounds total. Each tube holds 5, 2 ¾-inch shells or 4, 3-inchers, according to IWI literature. I’d suggest it would take the fight out of a small mob, to say nothing of the biggest brown bear on the planet. Featuring an 18.5-inch barrel, this shotgun is 28.34 inches OAL, so it will tuck nicely in the car trunk, behind the seat of a pickup or SUV, or in the corner of the closet inside the front door of someone’s house. It’s got a full-length 1913 Picatinny rail on top with M-LOK receptacles integral on each side for mounting accessories. It also has a cross bolt safety. IWI designed this shotgun with a unique—and patented—“Bullhead” bolt locking system specific to this model. When each tubular magazine is rotated into position, the Tavor TS12 automatically loads a round into the chamber. And here’s another little bonus: The barrel is internally threaded at the muzzle to accept Beretta/Benelli choke tubes. One choke tube comes with the TS12. According to Casey Flack, CEO of IWI US, the Tavor TS12 is the company’s first entry into the home-defense shotgun market. 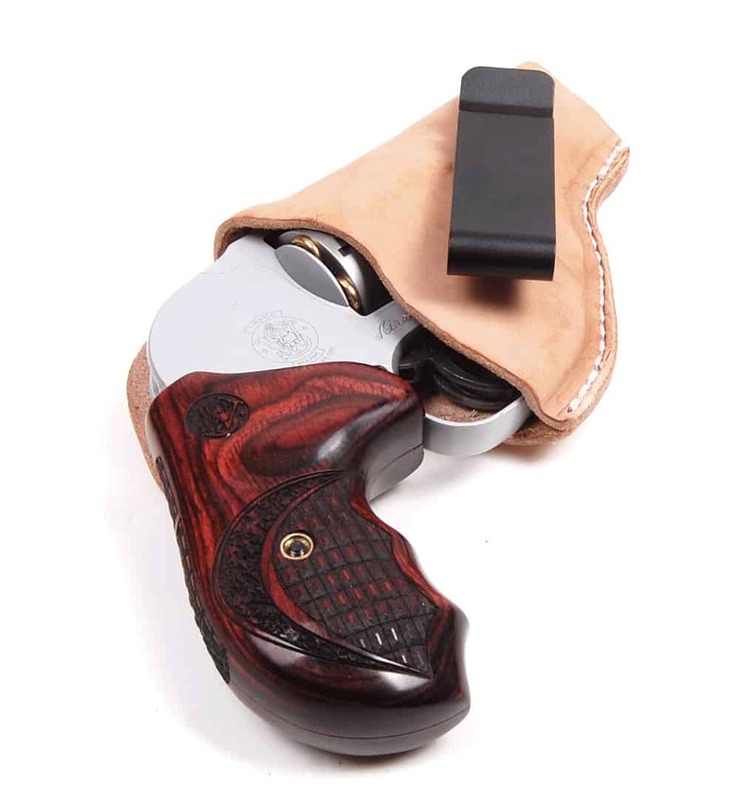 Its size and magazine capacity make it a very good choice for this purpose. The pistol grip extends below the shotgun body, and there is plenty of room for use of this model while wearing gloves. IWI also offers a couple of other bullpup models, the X95, chambered for either the .300 Blackout, 5.56mm NATO or the 9mm, and the Tavor SAR, in the same caliber offerings. With an MSRP of $1,399, the Tavor TS12 is likely to see quite a bit of interest from tactical types who want something different and potent. Easy to use and easy to clean, this new shotgun is as user-friendly as any defensive smoothbore to be found anywhere.